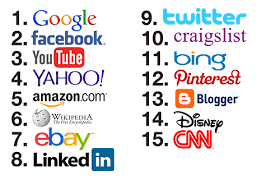 1.Google - The most used and biggest search engine in the world. 2.Facebook - The most popular social networking site. 3.YouTube - The most visited video sharing site. 4.Yahoo - The Second largest search engine in the world. 5.Amazon - The most popular internet shopping website. 6.Wikipedia - Biggest free online encyclopedia. 8.Linkedin - World’s largest professional network and third largest social networking website. 9.Twitter - Second largest social networking website. 10.Craigslist - Online network, which provides users with a central database for classified ads and forums from across the world. 11.bing - Third Largest search engine in the world. 12.Pinterest - Most popular image sharing website. 13.Blogger - A blog originally came from the word "weblog" or a "web log". You can think of it as an online journal or diary, although blogs are used for much more now, like online journalism. A blogger is someone who blogs, or writes content for a blog. Blogging is the act of writing a post for a blog. 14.Wordpress - Most popular and biggest blogging and content management system (CMS).